Like the Swing Kids carried their home-made "secret" recognition symbols at the lapels, you can also make your own "recognition sign" now! Who knows where you still meet some "Swingstyle-Syndicators" ? It contains variable logos and instructions. 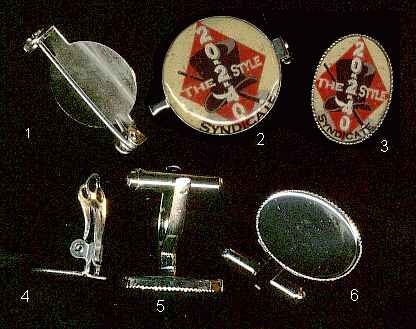 What you need in addition is a little fate, a clear two-components resin and a logo mounting device, like the below shown examples, which we found in a tinker accessories store among some "self made" jewelry accessories.